The 2018 World Junior Squash Championships continue in Chennai, India with the Men's Team Event kicking off tomorrow, Tuesday July 24th. There’s a long ways to go and a lot of solid teams at the World Junior Squash Championships, but based on Canada’s solid performances by Julien, James, George & Ryan in the individuals we will be seeded 2nd heading into the team event! Stay tuned for results from the team event... Go Canada Go! Next, the Canadian Squad faced off against a determined Argentinian team who put up a good fight. Our Canadian boys came out on top with a big W to top their pool and move onto the next round! Canada finishes first in pool B, securing their spot in the round of 16 and will face off against Australia  tomorrow at 11:00am (IST) - 1:30am (ET) & 10:30pm (PT). . Team Canada clinched their quarter-final spot as Ryan and James won the opening two matches. George won the best-of-3 dead rubber to consolidate the sweep for Canada! The quarter-finals will be a battle of North America, as Canada  faces off against the USA  tomorrow, Friday July 27th at 6:00pm (India Standard Time) - 8:30am (ET) & 5:30am (PT) in Canada. Our fantastic four faced a determined US squad in the Quarter Finals of the 2018 WSF World Junior Squash Championships (Chennai, India). Canada’s Superman, James Flynn, was up first for the #2 seeded Canadian squad. Down 2-0, James made an incredible comeback to take his match 3-2 over Tiber Worth [8-11, 8-11, 11-2, 11-2, 11-6]. Up next was Canada’s #1, Julien Gosset. Gosset has had a phenomenal World Juniors tournament thus far and was in position to secure Canada a spot in the Semi Finals. Up 2-1 and with match ball (10-6) in the fourth, Julien took a tumble. After injury time he took the court but unable to move he quickly lost the next four points and was forced to retire injured. In the decider, Canada's George Crowne fought hard and after dropping the first two games came back to take the 3rd 11-5. Canada has had an infinity for the 5-gamers this tournament so it looked like George was about to set it up for another exciting but nerve-wracking finish. In the fourth, the boys traded points but ultimately it was USA's Thomas Rossini who would take the game and the match 3-1 [11-9, 7-11, 11-5, 12-10]. Our boys will now face Pakistan in search of a top 5 finish when they start the 5/8 round tomorrow. After a tough day yesterday, the boys had to refocus and dig deep to earn the chance to play for 5th place. So, 13 hours later the squad was back on court minus their #1 player against Pakistan, the reigning World Junior Boys Team Champions. The 5-8 semi-final between Canada and Pakistan was back-and-forth and ultimately had to be decided with a tie-breaker match. Canada fought hard and beat Pakistan 2-1 on the show court, saving two match ball in the fifth game of the decider! In their final match, the boys came out strong and played with confidence and determination. Canada won the match 2-1 vs Malaysia to finish 5th at the 2018 World Junior Boys Team Championships! It was an unbelievable comeback from the boys after what happened in the quarters. We are so proud of this squad! Congratulations Julien, James, George & Ryan - you all made major contributions to the team and we wouldn’t be where we are without each and every one of you! And congratulations as well to coach Jonathan Hill and manager Chris Hanebury, you were both imperative to the success of this team at the World Juniors. Well done all! Yesterday coach Hill ordered an ‘Uber’ which turned out to be a tuk tuk that Jon generously and unbeknownst paid twice! Luckily the total was still under 200 rupees. When it came to match time James, Julien, Ryan and George all started a little edgy, but gained confidence and momentum as the match went on and breezed through in straight games. The courts were quite warm as it was 37 degrees outside making it difficult to hunt the volley and attack the front of the court. All 4 boys had to back up their first round wins with tougher battles in the round of 64. Up first was George who played much more aggressively and took down his Hong Kong opponent in a quick 3. Julien had to battle early on against a speedy and flashy Mexican boy, but played straight and took control of the middle of the court and again won in a convincing 3. Following was Ryan who hit some of the best width and length of the team and created countless openings. He had a few long hard rallies, but proved too consistent and beat his American opponent in 3. James was last up for our squad and in an up and down match hit 1 too many winners and outshot the Argentina #1 to take it in 3. 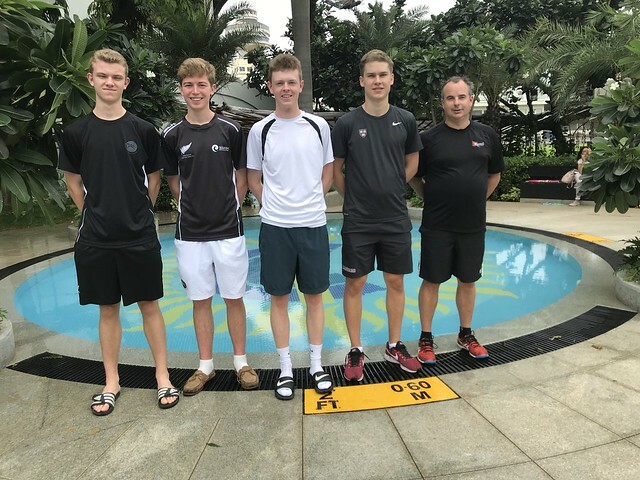 The Canadian Squash squad had 3 wins on day 2 of the 2018 WSF World Junior Squash Championships in Chennai, India. This is the first time Canada has had 3 boys in the final 16. George started the day by coming back from a game down to beat Malik of England in 4 [4-11 13-11 11-4 11-6]. Julien played the Hong Kong’s #1 player and had a convincing 3-0 victory [11-5 11-4 11-4]. Ryan had a battle against El Serty from Egypt. It was a physical and mental battle and he pushed the 3/4 seed and although he lost in straight games the match could have gone either way. In Canada’s final round of 32 match James took down the #1 American in a hard fought 3. Next up for the Canadians are 2 Egyptians and the Mexican #1. George plays the top seed Marwan Tarek of Egypt and Julien plays his compatriot Omar El Torkey. James will face off against Leonel Cardenas. Canadians are playing well and representing Canada well! They look to keep it going through their next matches. Team Canada may have been on the losing end of their round of 16 matches, but they went down swinging. George went tooth and nail with the #1 seed and British Junior Open champion Tarak. On his first match on the glass George looked comfortable and confident and physically tested the top seed in a tough 4 games. Julien was next on the glass and took some time to adjust going down 0-2 to the 3/4 seed El Torkey, also of Egypt. Julien fought back to level the match before losing out in the final game 9-11. Watch Julien push 3/4 seed El Torkey of Egypt to 5 games here. James was Canada’s last hope as he was up against the speedy, hard hitting Mexican Cardonas. James dug deep and eventually came up short in another 4 game battle. Ryan, George, Julien and James pushed the top seeds in the event and these results should help Canada secure a top 8 seeding going into the team event. Canada put every country on notice that we are back at the top of our game and are ready to compete with the worlds best. James, George, and Julien all made it to the final 16, which was the first time Canada has had 3 boys in the final 16! Congratulations to all our juniors! Check out photos of Team Canada throughout the Championships!